Alibre CAD accommodates the best of both worlds when working in 2D or 3D sketch mode. So much of the way it works just feels natural. That doesn’t mean I’m not struggling to find some features but when I learn the procedure is makes sense. For instance, I’m used to specifying accurate positions for drawing elements as I place them in other CAD systems. With Alibre I sketch out the general shape first then through the use of dimensions the drawing starts transforming into the precise figure I’m wanting. To top it off, these dimensions can be entered in the form of equations that allow the entire part to be resized by changing a few constraining dimension values. Labyrinth Game Platform Corner Closeout folded and unfolded. Designing in the Sheet Metal Workspace is almost magical by creating folded parts from out of thin air. When you identify a surface then an edge where the bend takes place the folded part just appears. When you create a new sheet metal part you should review the properties settings to specify the material type and thickness you’re working with. You can adjust the K-Factor value associated with the material so it accurately includes any additional material needed to represent an acutal bend properly. Once everything is folded up as in the Labyrinth Game Platform’s Corner Closeout shown above you can unfold everything to get the sheet size and pattern to construct the part from. My first attempt at modeling the corner closeout piece is close to the part I’m wanting to build but still needs some work. I have a couple of end pieces with chamfered corners that aren’t wanted. I still have some things to learn about controlling the chamfer tool or learning a different way to remove material from the part. Today is a day for using two computer screens at the same time as I work through tutorials on Alibre. At our Robotic Labyrinth builder’s meeting Saturday, Richard Brull showed me a 3D part model that he designed using the Alibre Design System and suggested I give it a try. I have been dreading drawing the plans out with my usual Computer Aided Design (CAD) tools. This is an exciting tool! Normally I avoid time locked demo versions of software but Alibre gives me a full version for 30 days then allows me to run the Alibre Design Xpress forever. At least the time I invest now learning their product is not all lost when the evaluation mode expires. I do have to hurry though, my favorite feature is part of their Professional Version upgrade. Over the last year I’ve tried using QCad and an older version of AutoSketch I bought at a garage sale to lay out my sheet metal projects. 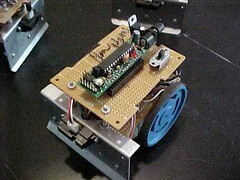 They work and have improved my accuracy and precision when building small projects. I don’t have CNC milling machines but instead build using simpler tools like a drill press and band saw. My projects have come out fitting together pretty well because of the templates and patterns I’ve made using CAD. I have fallen in love with Alibre’s SheetMetal workspace feature. This is going to be great for laying out the aluminum sheets for our labyrinth game platform’s top and bottom skins. We can model the foam core of the composite and design the close out end pieces to fit right into place. The close out pieces are dependent on the exact thickness of the foam and Alibre’s parametric design feature can easily adjust our design if the actual thickness of the material we receive is different from what was planned. Each of the pieces can be modeled separately then brought together as an assembly. The metal bending feature takes care of the additional length needed just as the real bends are made. The designs can then be unfolded as a flat pattern used for cutting and drilling holes. Better yet, this can go directly to CNC equipment like a water jet for a precision fit. “I thought this would be some lame class where the instructor sets down a kit then goes off for coffee and comes back about an hour later. This class is exactly what I wanted”. The complement was from a kid who’s hydrogen experiment blew up his basement. This was a fun session for me too. Design our chassis and digitally folding the sheet metal. People tend to identify who we are by what we do for a living. Throughout the last 20 years I was an independent contractor writing custom software for clients using MicroStation CAD systems. So my first choice in CAD was Bentley System’s MicroStation, simply because I’ve used it for so long and know it best. As Bentley’s Corporate policies changed, the markets began closing for resellers of MicroStation so my clients began going out of business one by one. Then Bentley began shipping programming opportunities overseas. Their licensing for software developers evolved into a fee of over $2,000 per year until I couldn’t justify that expense any longer. Clients stopped calling, my software license expired, traveling stopped, billing stopped, coding programs stopped, cell phone service stopped and one of the hardest things to come to terms with, it seemed my identity stopped too. Last Monday with the donation of warehouse space I realized the responsibility of being accessible for this project. Even though I’m unemployed and volunteering my time, I borrowed some money to have a cell phone while spending so much time away from the house. I have lost a few slips of paper I was keeping notes on so I spent more money than I should on refill pages for my Franklin Planner. Then today working through the Alibre tutorials I had a brief sense of who I once was triggered by a phone, a planner, and a CAD system. Even if the cell phone doesn’t work after the end of the month and the CAD program looses its nice features in 30 days it was a nice moment reflecting on who I once was. I feel for the thousands of people who are loosing their jobs now and ultimately the identity they’ve become to know too. 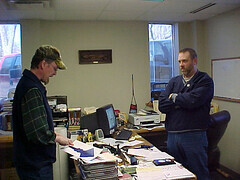 Tom is working with Jay Lind of The Apprentice & Journeyman Training Fund of Sheet Metal Workers Local Union No. 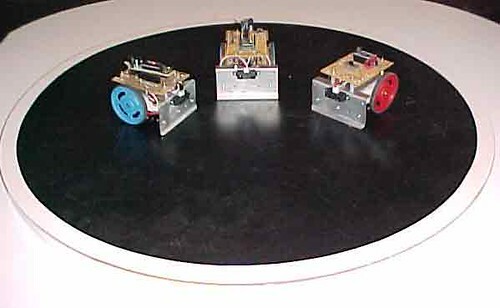 2 to get the Robotic Labyrinth base designed and built. 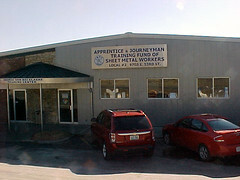 This is a training facility located in Raytown Missouri. The students work on community service projects as part of their training and will be building the base supporting the labyrinth game platform. Jay took us on a tour of the facility showing us the work areas and their CAD room. Tom requested a few minor changes to the design. 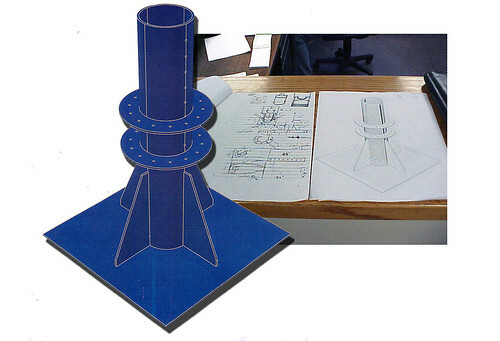 The design shown above is for the main shaft holding the platform. Leg extensions to keep everything from toppling over are not shown in the drawing. With all the excitement of our first meeting in the new Underground Lab we still had time to discuss the labyrinth project too. I’m excited about the work Jestin and Ax0n are doing to get an embedded linux platform up and running.